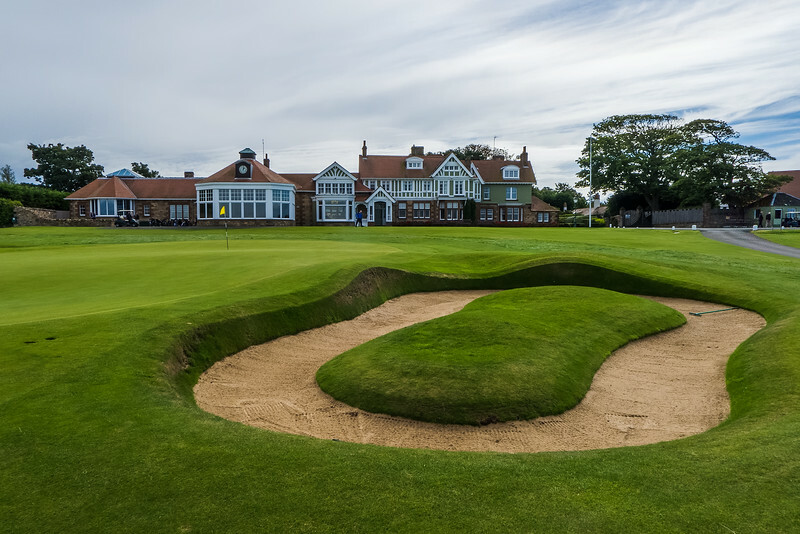 In the weeks leading up to playing Muirfield, I tried to learn what made the course one of the top in the world. I knew it didn’t contain the same magical views as Dornoch or the difficulty of Portrush. I did know that Jack Nicklaus loved it so much he named his own course, Muirfield Village in Dublin, Ohio, after it. What I can tell you is that if I ever have the opportunity to build my own course (highly unlikely), I might name it Muirfield as well. It is that special of a place. The first unusual part of your day at Muirfield is that you don’t actually drive through the gates. You’re actually asked to park (or be dropped off) about fifty yards outside and you’re then taken by cart through the hallowed gates. I made the mistake of actually driving in and I consider myself lucky that they still let me in; apparently they don’t take well to rule breakers at Muirfield. According to my caddie Vijay Singh was kicked out, along with his whole party, when he refused to end his phone call on the course. My minor issue aside, I was off and ready on my day at Muirfield. The locker room is everything you’d expect at such an old club. Deep, dark woods, a lot of golf history although not as much Open Championship memorabilia as expected. As a matter of fact, there is really no evidence at all that major championships have been played there, just a simple, elegant place to change, shower, etc. One other interesting tidbit was that not only did their sinks contain the usual soap, lotion, and other cleansing items, they also had brushes, presumably to clean one’s dirty fingernails after a tough morning 18. Muirfield also could have had the least-friendly locker room in my travels. Not a single golfer of the half-dozen I greeted actually returned an acknowledgment. Granted none of these individuals would have been actual members on the Tuesday (visitor day) I played, but you’d think more people who got the opportunity to play this course would be a little more outgoing, if not mildly polite. The practice area at Muirfield, much like the locker room, is simple and practical. It has the requisite perfect grass although they asked us to hit off the plastic mats on the Tuesday that I played. There is also the standard short game area, complete with a pot bunker to prepare for the day that lies ahead. All in all everything is excellent if not slightly short of many modern PGA Tour locations. 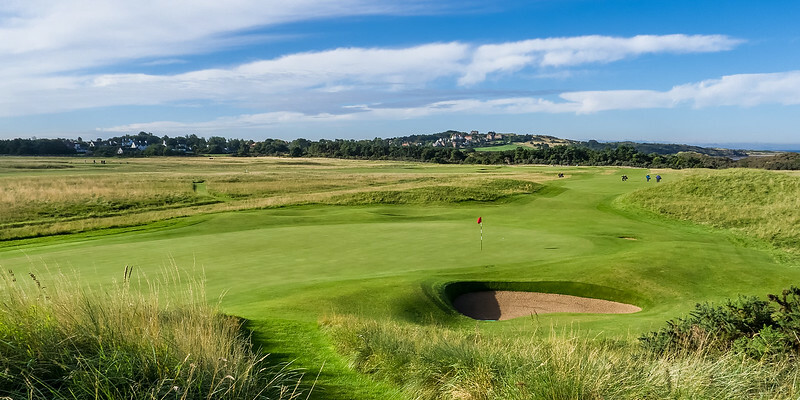 One thing you’ll notice about most of the private and Open rota courses in the UK is that they are fairly strict about from which tees one is allowed to play. Typically they’re short by American standards; usually around 6,000 yards +\-. At Muirfield, there is one set of tees for male visitors. There is no option to play “from the tips.” There is another set of tees that would be considered “forward tees” but they appear to be for seniors or possibly ladies, provided they’re actually allowed on the grounds. I didn’t see a single female (besides staff) in my day there and there are no female members at this point. The tees (and yardages) at Muirfield (this according to my caddy) are set up in three sets of six holes. There are six holes that are set up at what would be considered “easy” yardages, six holes are set up at standard member lengths, and six holes are at Championship length. The total distance when I played was over 6700 yards and pretty much none of the holes one would consider to be “breathers.” There were no 500 yard par 4’s but plenty of 400+ holes that played into the wind. It’s definitely a course where you can see how they can make it really, really tough if they want to. 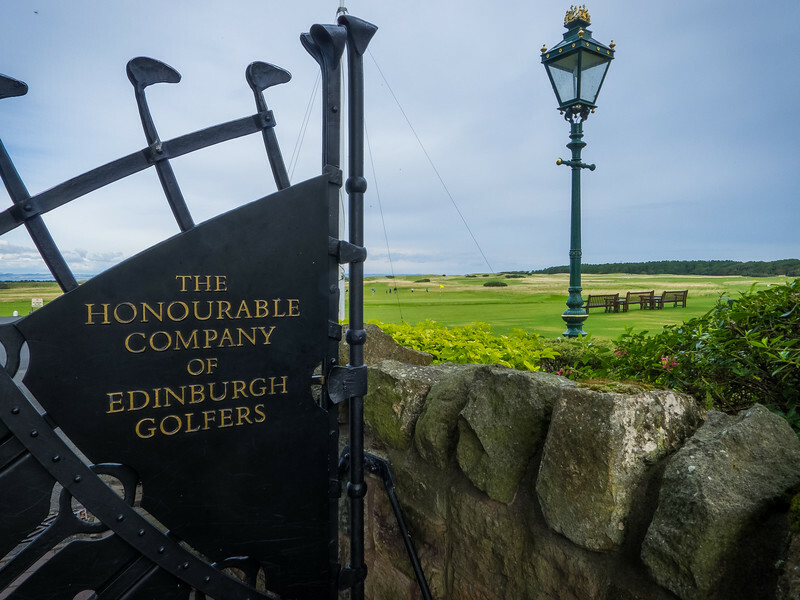 So what makes Muirfield one of the best? First off, the property is one of the most beautiful, tranquil spots I’ve ever seen. 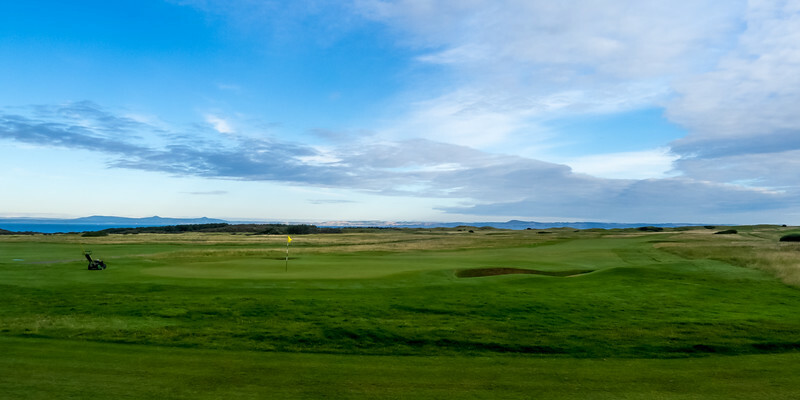 It’s hard to imagine it with 75,000 fans roaming its grounds during the Open Championship. It’s kind of how I picture Augusta National when the Masters Tournament isn’t being played; just beautiful, open scenery where they happened to put a golf course. 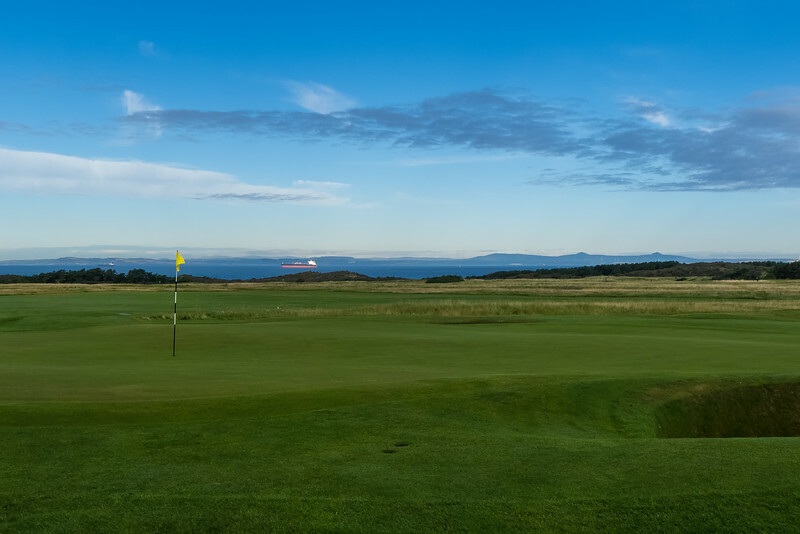 While it’s not on the water, the Firth of Forth is visible from many of the holes. It’s just tees, green fairways, yellowish rough, bunkers, and greens. There are no features that will wow most visitors. The genius of Muirfield starts with the driving. The fairways are wide enough to provide only a slight bit of relief to wayward drives. More importantly they will reward a shot played to the proper side with the appropriate shape. 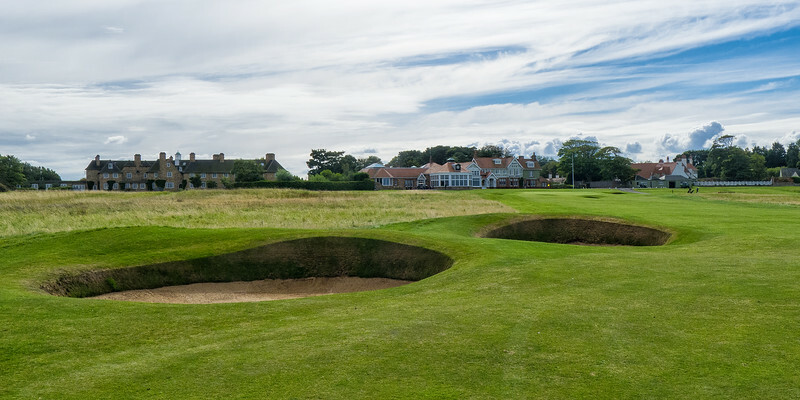 One thing is certain, if you miss fairways at Muirfield you will struggle. The rough I encounter there was by far the most challenging I’ve ever faced. The bunkering is, in the opinion of many, some of the best in golf. I encountered none of what I’d consider to be silly bunkers, those that punish a good shot. There are however many, many bunkers that will punish a poor shot. There are also many bunkers that will make you consider the best way to lay up, or just as often, make you rethink the best way back in play after a wayward tee shot. Possibly my favorite aspect of the course was its greens. As one would expect, they are very, very quick. They are not however, extreme in any sense of the word. They are not overly large, nor are they so small as to be challenging to hit. They are just subtle enough in their breaks to be challenging. Much like the fairways, if you are in the right spots you are in good shape, if you miss it will take a tough read and confident stroke to get down in two. I encountered no spots where it would be impossible from which to two putt, but many where it was quite challenging. After I was lucky enough to land my tee time at Muirfield and asked to pay for it in advance, I had a slight bit of buyers remorse. In my travels to the UK it was the most expensive round by a fairly wide margin. As a mentioned earlier, I wasn’t even sure what made the course so great. After playing it I’m happy to report it might be my favorite course in the UK. I’m still not sure if I can successfully describe what makes it so great but I do know it’s just a solid, fair, and challenging test of golf on a beautiful piece of property. Hopefully some day I’ll make it back there. If you liked the photography in this post click here to go to my website to see full-size versions of all the images. All images are free to use as your desktop wallpaper and may also be purchased as prints.